It’s all about down jackets in our website lately and we are continuing along the same lines today also. 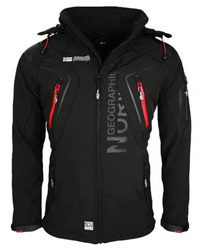 We will be going through 8 jackets by two brands, The North Face and Marmot, with options for both men and women. Today’s topic is specifically about 700 fill power Down insulation. 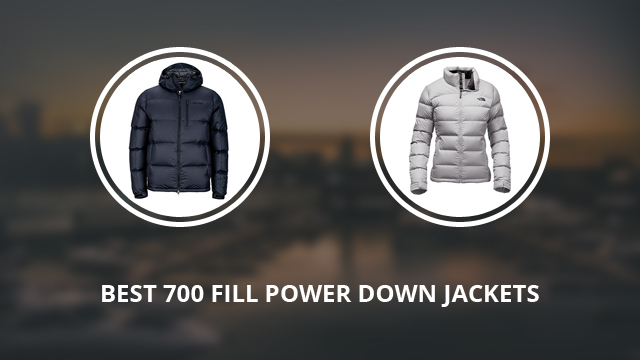 What fill power indicates, is the jacket’s ability to provide warmth and its compressibility. The higher the fill power, the less is needed to provide insulation and the better it compresses. The type of down also plays a role, with Goose being of higher quality and better at insulating, whereas Duck is a lot more durable and suffers less ability loss when wet. 700 fill power falls in the middle of the quality range, if we were to call it that. 900 being the highest that is easy to find and 550 being the typical fill power you will come across. This rating is great at providing warmth at a very light weight, and it compresses adequately, without too much fuss and most importantly, without damage. We will get started with the men’s selection of The North Face jackets and move on to Marmot afterwards. 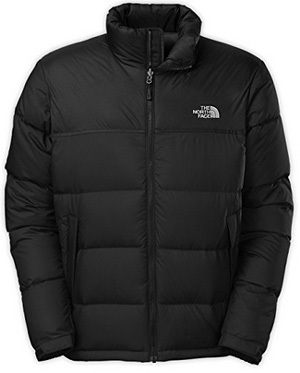 The first jacket is Nuptse, a 100% Nylon jacket with Goose down insulation. It comes with a high collar, but is hoodless. The shell is water-resistant, should you be caught in sudden raining, but it is advised to wear it in dry weather, as with most down jackets. There are two side pockets on the outside, which are lined on the inside to warm up the hands quickly. On the inside there is also a pocket, which serves as a packing pocket, where you can stow the jacket into for travel. The sleeve cuffs are adjustable by Velcro fasteners and there are 9 options to choose from, including: Black, Venom yellow and Sequoia red. 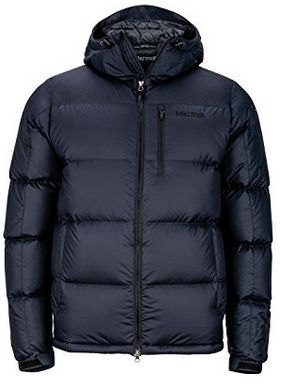 Now onto Marmot‘s jackets for men, this one is Stockholm, a puffer jacket with a 100% Polyester shell, with MemBrain lamination. This is a special fabric technology by the brand itself, which makes the jacket waterproof and yet very breathable. Along with the Down Defender treatment, Stockholm is one of the few down jackets out there that you can wear in any weather. It will not get wet, nor will the down insulation lose its abilities by trapping moisture. There is a removable hood and a high collar, along with several outer and inner pockets for storage. It comes with microfleece internal sleeve cuffs that provide great warmth and comfort. There are 7 colors to choose from: Black, Deep forest, Jet black, Rocket red, Steel, Steel onyx and Surf. 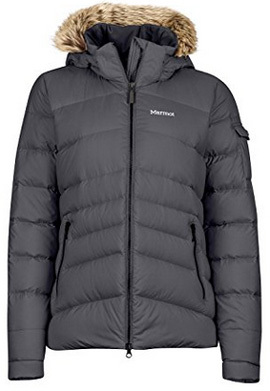 The third and last men’s jacket is also by Marmot and it’s the Guides Hoody puffer jacket. It comes with a hooded collar and it is made of 90% Polyester and 10% elastane. Because of that, it wears very comfortably and provides great coziness and warmth. The insulation is protected by Down Defender, which prevents moisture from getting trapped into the insulation. 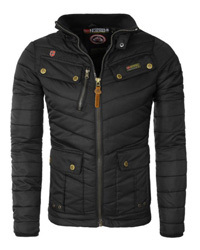 This is a versatile jacket that works both as a casual jacket and also for sports wear. It is suitable for different weather conditions as it is highly water-resistant. It comes with three outer pockets and an inner pocket as well. The sleeve cuffs are adjustable by Velcro, while the hood adjusts with drawstrings. There are 7 color options: Black, Cobalt blue, Jet black, Slate grey, Team red, True blue and Blue sapphire. 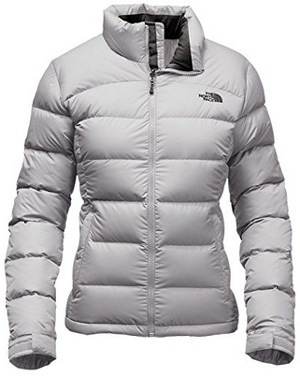 For the women’s selection we have picked one The North Face jacket, which is the Nuptse 2 model. This jacket is made of 100% Nylon and it is water-resistant. Just like the men’s version, it is hoodless and with a padded collar, as well as with adjustable sleeve cuffs. There are two side pockets for the hands and it comes in a very elegant design. There is double-layer taffeta paneling at the shoulders, which gives the jacket a high durability to wear and tear, so it will last for many seasons. There are 10+ color options, including: High risk red, White, Green, Black and Quail grey. 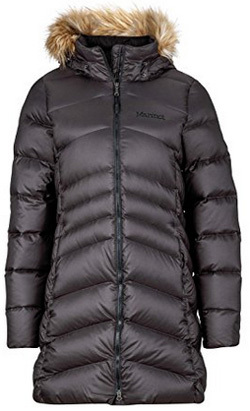 The rest of the jackets are by Marmot and their first design is the Montreaux puffer coat. This is a long jacket with beautiful diagonal quilting and a very stylish cut. It is made of 100% Polyester and it is also water-resistant, suitable for daily wear in harsh temperatures. There are two hand-warmer pockets on the outside, which are lined with microfleece. There are also inner pockets for extra storage and safety. It is hoodless but with a high collar and it comes in the colors: Arctic navy, Berry wine and Jet black. This next design is called Ithaca and it is made of 100% Ripstop polyester, which is highly durable and water-resisant. 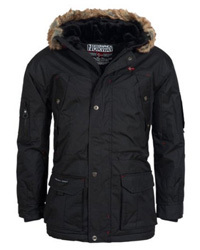 It is a very well-insulated jacket, with a fur-trim lined hood that will protect you against blizzards and cold winds. Just like the men’s jackets, the insulation is protected by Down Defender against moisture. There are two side pockets and one sleeve pocket on the outside, along with an inner zippered pocket for extra security. It has a two-way zipper and it is hip-length. The color selection includes: Dark steel, Glacier grey and Jet black. 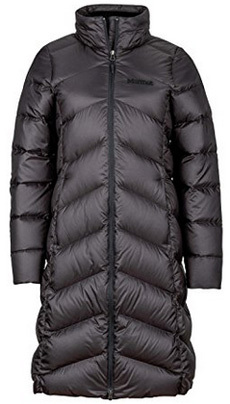 Another long coat, Montreal is a knee-length puffer jacket made of 100% Polyester. 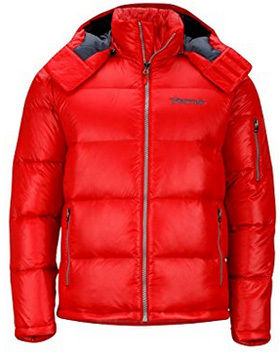 The insulation is moisture-resistant and provides great warmth in low temperatures. 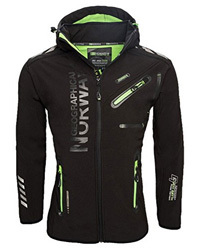 It is a hooded jacket, with synthetic fur trim lining the hood for extra protection. To make movement and sitting down easier, the main zipper is two-way so you won’t have to take the jacket off to be comfortable when sitting down. It comes with two layers of sleeve cuffs, the inner ones having microfleece lining for added warmth. There are 3 colors to choose from: Dark steel, Glacier grey and Jet black. 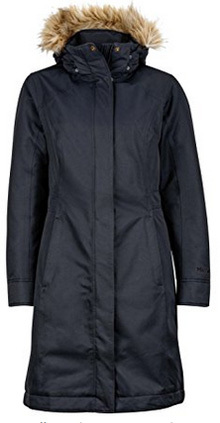 We will conclude today’s selection with Chelsea a lovely winter rain coat that comes in a very stylish design. This is a hooded jacket, with faux fur trim around the hood and made of 100% Polyester. It comes with adjustable sleeve cuffs and a two-way full-length zipper, as well as a storm placket for better protection. It is water-repellent and less bulky than the previous jackets, while also being smooth on the outside rather than quilted. There is microfleece lining in the pockets, to quickly warm up your hands. It comes in the colors: Black, Deep olive, Jet black, Platinum, Steel onyx and Urban army. Previous Article← Canada Goose vs Moncler: Which Brand is Better?